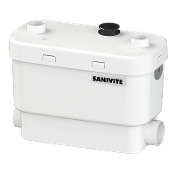 The Saniflo Sanivite is a heavy duty gray water pump that is ideally suitable for use in a basement apartment or anywhere where additional fixtures are wanted. 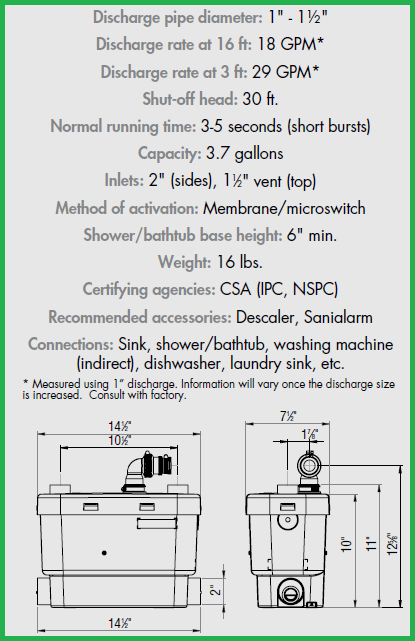 The Sanivite will pump gray water waste away from a variety of sources such as: a kitchen sink, laundry sink, washing machine (indirect connection), dishwasher, bar sink, etc. The Saniflo Sanivite model was designed to sustain the toughest applications meant for gray water pumps. The Sanivite pump's capabilities and unique design are the reason why these range of Saniflo pumps are preferred for heavy duty applications. 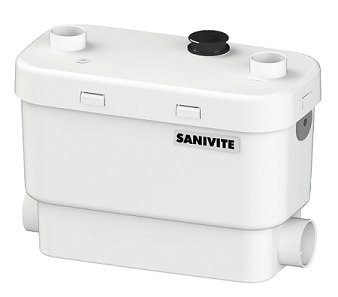 In addition to a sink, the Saniflo Sanivite gray water pump will also accept and discharge the waste water from a variety of other sanitary fixtures such as: a shower, a bathtub, a urinal and a whirlpool.